The Virgo Cluster of Galaxies contains over a thousand member galaxies including our very own Milky Way galaxy. This image shows a six by four degree field that contains over 85 easily recognizable galaxies. 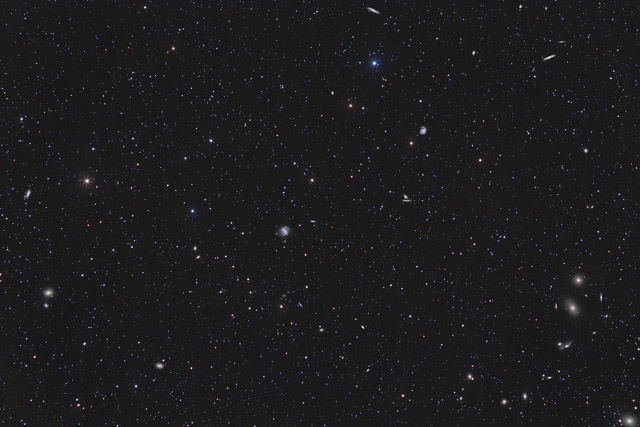 Included in this field of view is the cluster's dominant galaxy, M87 (lower right corner), M84 and M86 (large lenticular galaxies in lower right), Markarian's Chain ("J" shaped string of galaxies in the lower right including M84 and M86), M100 (spiral galaxy in center of image), M98 (large spiral galaxy at top center), and M85 (lenticular galaxy middle left). In this image, North is to the left. The image is a composite of a 200mm widefield base image combined with several detail images taken at 1260mm through my C-8. This image is cropped to 97% of the original frame. Software Used Images Plus 5.5 for camera control, calibration, stacking, digital development, smoothing and noise reduction, multiresolution sharpening, and star size and halo reduction. Photoshop CS5 used for levels and curves, high pass filter, star shrinking, screen mask invert, selective color, lab color, unsharp mask. Gradient Xterminator for gradient removal. Registar for registration and stack alignment. Carboni Tools for additional noise reduction and smoothing. Notes Although its difficult to see the galaxies due to their small size in this field of view, I was happy with the multitude of galaxies I captured and how well the full resolution version shows them.